Thousands of people gathered in the New York borough of Staten Island near the site of Eric Garner’s death to march in protest against police killings. Eric Garner, a 43-year-old black man, died in July after being placed in a chokehold as police arrested him for allegedly selling untaxed cigarettes. The march was led by the Rev. 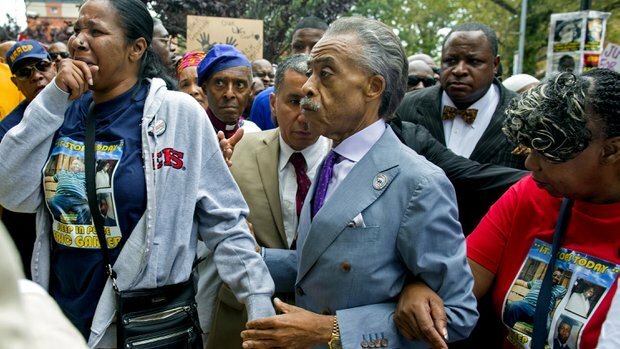 Al Sharpton and relatives of Eric Garner. Eric Garner died weeks before black teenager Michael Brown was killed in Missouri. Michael Brown, 18, was shot dead on August 9 after being stopped by a police officer for walking in the street in the St Louis suburb of Ferguson. The killing sparked days of protest culminating in the deployment of the National Guard, which was withdrawn on August 22. Some of the protesters in New York displayed banners saying “Black lives matter” while others demanded justice in the cases of both Eric Garner and Michael Brown, as a large police contingent looked on. Some shops were closed for the day on August 23, amid fears the protest could turn violent as happened in Ferguson earlier this week. However, civil rights activist Rev. Al Sharpton repeatedly warned demonstrators that such action would not be tolerated. He said that Eric Garner’s death was a defining moment for police nationwide. In the event protesters filed peacefully past the spot where Mr Garner was held to the ground by police as the marchers processed towards the the Staten Island prosecutor’s office. “We will prevail,” the black reverend – who was accompanied by Eric Garner’s widow and several of his children – told the crowd. The demonstrators demanded the prosecution of Daniel Pantaleo, the suspended police officer who arrested Eric Garner. Some chanted “Hands up, don’t shoot” – the slogan often used by the Ferguson demonstrators. A New York grand jury is considering criminal charges against Daniel Pantaleo. Eric Garner, who had asthma, was heard on a witness video shouting “I can’t breathe!” as police arrested him. A medical examiner has ruled his death a homicide. However, the New York City medical examiner’s office said other factors contributed to his death included asthma and heart disease. Eric Garner’s death provoked an outcry, especially after a video of Officer Daniel Pantaleo placing him in a chokehold became public. Chokeholds are banned by the New York Police Department and Commissioner William Bratton has ordered an internal review of training.